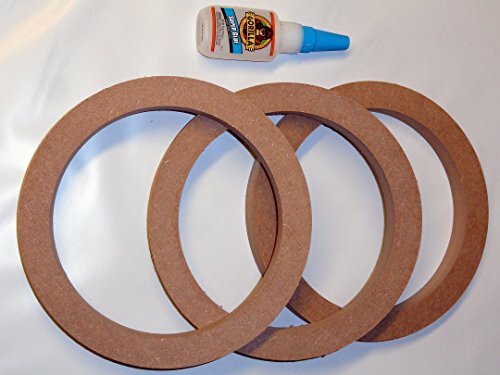 4" MDF Speaker or Subwoofer Spacer Rings Case Pack Each Kit Includes; ( 3 ) Pack of MDF Rings; ( 1 ) Gorilla Glue (glue size will vary) Easily add 3/4" Spacer for Custom Installation. Fits all 4" Speakers and Subwoofers. Made from Heavy Duty 3/4" MDF. Easily Paintable or Primed. Inner Dimensions 3.5"; Outer Dimensions 4.5" See Picture for detailed dimensions. Easily add 3/4" Spacer for Custom Installation. Fits all 4" Speakers and Subwoofers. Made from Heavy Duty 3/4" MDF. Easily Paintable or Primed. Inner Dimensions 3.5"; Outer Dimensions 4.5" See Picture for detailed dimensions.